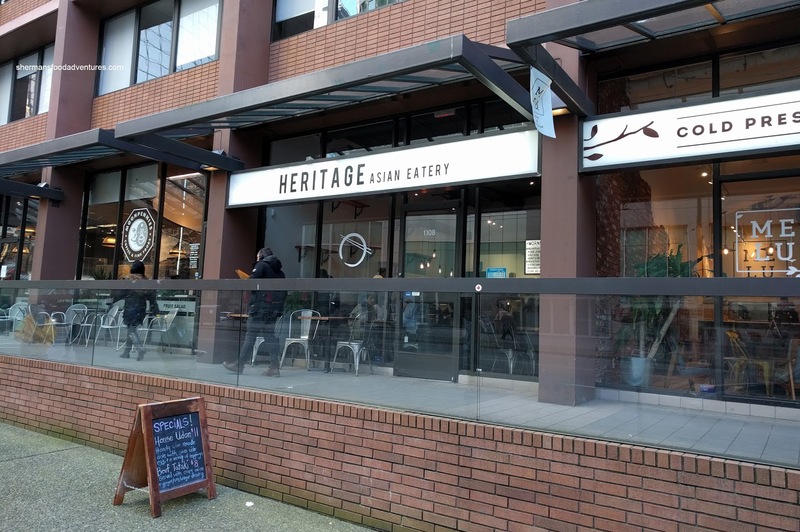 For all of the lunch options in Downtown Vancouver, it is rather surprising that there are very few interesting choices. We have the usual chain restaurants as well as fast food mixed in with the many Japanese restaurants and ramen joints. Finally, we see the first lunch spot featuring Bao in Heritage Asian Eatery. 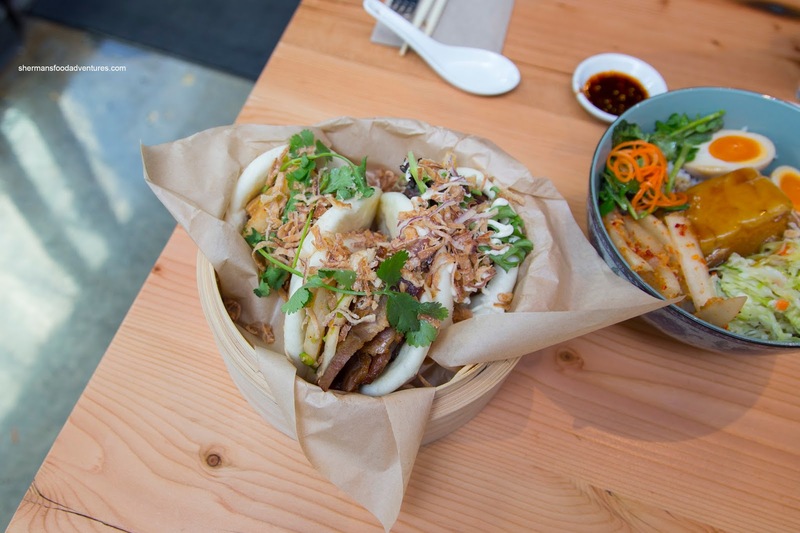 It is kinda ironic that Miami got their own Bao Shop over 3 years ago before Vancouver (the epicenter of Chinese food in North America). Vandelay and I decided to check the place out for lunch to see what the fuss was all about. We went straight for the 3 Bao for $18.00 deal with the Duck, Cotechino and Pork Shoulder. Our favourite was the tender and fatty pork shoulder, there was plenty of it which made the bao substantial. However, as much as the pork was well-seasoned, the flavours were pretty one-note. The bao itself was soft and didn't fall apart on us. I thought the duck was a little dry and surprisingly bland considering the classic combo of hoisin, pickled cukes and crispy onion. The most interesting of the 3 was the cotechino as it was soft and actually melded well with the bao. It was rather mild-tasting and even the pickled carrots, mayo and crispy onions didn't create much impact. 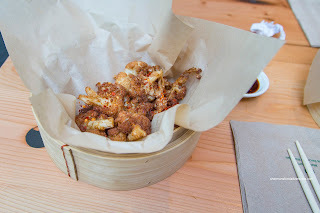 For our sides, we decided to try the Five Spice Chicken Wings and the Fried Cauliflower. 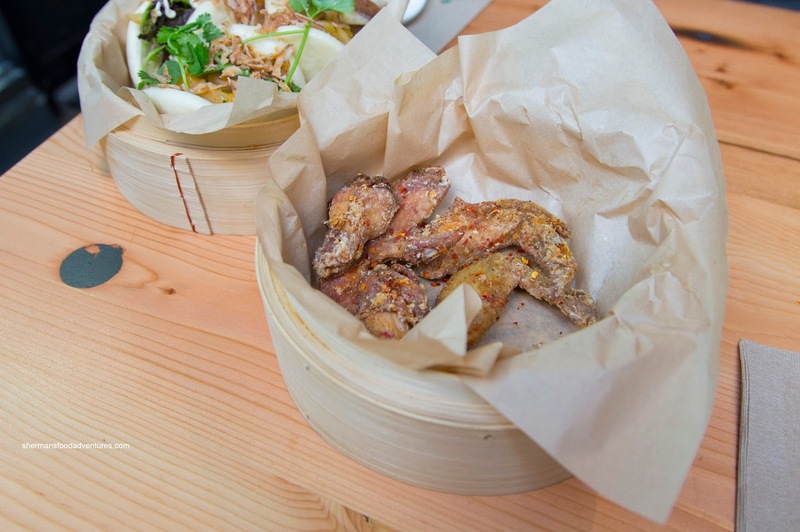 We found the wings crispy with well-rendered skin. Inside, the meat was tender and almost juicy. The outside was akin to the ones found at Phnom Penh but the flavours were a bit different. There was a considerable amount of MSG on the outside which made them tasty. The dusting of chili flake seasoning added a touch of spice. As much as the cauliflower looked nicely browned and caramelized, we weren't fans of the texture. They were limp and soggy. Flavourwise, a bit more acidity from lemon would've brought it to life. 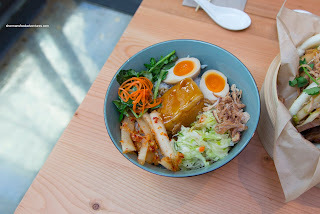 Our last item was the Pork Belly Bowl featuring a fatty and moist piece of meat, yuzu slaw, watercress, crispy onions, kimchi daikon & slow cooked marinated egg.. It was again one-note in flavour though with a background saltiness broken up with a touch of tang from the daikon. I thought the slow-cooked egg was good but a little salty. The most unappealing part of the bowl was the soggy rice. Vandelay and I came away from this meal a bit disappointed as we had hoped and wished it would be more impactful. As much as we find Torafuku overloaded with flavour, it would've been nice if Heritage could meet those flavours halfway. There is plenty of potential here, maybe a visit later might yield better results.